This blog post taps into some of the theories outlined by behavioral finance. Specifically I’m going to look at research done on what is called overconfidence. Overconfidence among investors can manifest itself in many ways. One of these forms is excessive optimism (or pessimism) with regards to beliefs in future outcome. Carleton, Chen, and Steiner (1998) and Jegadeesh, and Kim (2003) study the value of analyst recommendations. There are two aspects worth considering specifically in this context. The first is the quality of the recommendations and the second is the market reaction to them. The value of an analyst report can be defined as its impact on the market, thus the quality of the report and market reaction is not mutually exclusive but rather tightly linked. This poses some potential issues as there might be a feedback loop at work here, where analysts with a broader audience could potentially have a bigger impact than more unknown analysts with less exposure. However, given that the topic in question is an anomaly of the efficient market hypothesis, this potential feedback loop is of interest. In an efficient market, any new information in the form of a buy/sell recommendation must only have an immediate impact without any positive serial correlation in future abnormal returns if it represents new information. I will begin by analyzing a number of aspects related to analyst recommendations and proceed to cover market impact. Skewing analyst recommendations in a positive direction to minimize underwriter risk. Skewing analyst recommendations in a positive direction as a method to attract potential future business. These factors could contribute in explaining why recommendations typically tend to be positive, as recognized by Pratt (1993). In fact, as shown by the table below and documented by Carleton, et al. (1998), there is a difference between the numbers of buy and sell recommendations. National brokers are, from the Compustat registry, defined as (US based) securities firms conducting securities business throughout the nation. Regional brokers are instead conducting business in a smaller defined region within the country. Non-brokerage firms do not conduct sell-side business. From these figures it is clear that analysts favor buy or hold recommendations. Further, although non-broker firms are not subject to the potential conflicts of interest described above, there is still a heavy skew towards giving buy/hold recommendations. In that sense, even if the brokers show signs of agency cost it does not fully explain the buy/hold skew. To further understand the quality of these recommendations we need to dig into the potential performance of portfolios acting on changes in recommendations. Michaely and Womack (1997) find that of 391 initial public offerings (IPOs) in 1990 and 1991, underwriters’ recommendations perform worse than those made by non-underwriters. This is valid both prior to, at the time of, and subsequent to the recommendation date. More relevant to investor’s decision-making based on these recommendations we can study the details of Jegadeesh and Kim (2003). In the graph below the abnormal returns for company stock prices after changes in recommendations are shown (US based results). The x-axis show us the number of trading days after the revision date, with only the significant results included. As expected we see an immediate change on day 0 when the recommendation change is announced. Even more interesting, however, is the persistence in these abnormal returns. Abnormal returns are defined as raw returns minus the market returns. Jegadeesh and Kim report that despite the US market being one of the most developed markets in the world, the US-based results demonstrate this efficient market anomaly more clearly than the other countries included in the study. Based on these results, we can conclude that investors are over optimistic (or pessimistic) about the future growth of the companies in question, convinced of the accuracy of the positive recommendations. 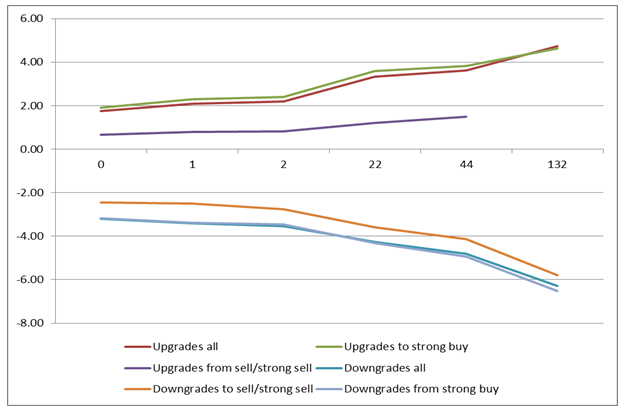 Also interesting is the level of abnormal returns when we compare upgrades from “sell”/”strong sell” and upgrades to “strong buy”; the previous “sell”/”strong sell” recommendation seems to persist in the minds of investors. The opposite is found when observing downgrades to “sell”/”strong sell” and downgrades from “strong buy”: downgrades from “strong buy” appear to cause a mental shock for investors with a more persistent effect compared to downgrades from a “hold” recommendation for example. It is also worth mentioning that analysts themselves are subject to the behavioral bias in the sense that they release seemingly correlated recommendations: during bull markets they release more buy recommendations than sell, and vice versa in bear markets. Unreported results indicate this is significantly related to the previous six month market returns and may be explained by herding behavior and the general tendency to avoid “sticking out from the crowd”. Finally with regards to investor behavior, it is shown that transaction volume increases over normalized volume for several days after changes in recommendations occurs. From other studies it has been shown that overconfidence leads to excessive trading, further indicating that investors are overconfident in analyst recommendations. CARLETON, W.T., CHEN, C.R. and STEINER, T.L., 1998. Optimism Biases among Brokerage and Non-Brokerage Firms’ Equity Recommendations: Agency Costs in the Investment Industry. Financial Management, 27(1), pp. pp. 17-30. JEGADEESH, N. and KIM, W., 2003. Value of Analyst Recommendations: International Evidence. SSRN eLibrary. MICHAELY, R. and WOMACK, K.L., 1999. Conflict of Interest and the Credibility of Underwriter Analyst Recommendations. The Review of Financial Studies, 12(4), pp. pp. 653-686. This TED video about cognitive biases common to love and money management reminded me of the behavioral finance stuff you feature on the blog. Enjoy!